When an envelope with this return address shows up in your mailbox, you immediately toss all other mail aside and open it. At least I did. It was a receipt acknowledging that they have our I-800A paperwork. They received it on Feb. 19th. In 10-14 days, we will get (in the mail) a date and location for our biometrics appointment, at which they will take our fingerprints and photographs. True confessions - I had to look up what biometrics was. Biometrics refers to the identification of humans by their characteristics or traits. I guess they need to make sure we are who we say we are. We are the Harmons and yes, we want to adopt a boy from China. Yes, yes, yes. In other adoption news, we got an email on Monday that the agency that did our home study (Frank Adoption Center) is closing. You read that right, they are closing. Apparently with Russia shutting down adoptions with American families, this agency couldn't financially keep going. It's sad. And even sadder for the sweet kids in Russia that won't get adopted now. It breaks my heart into a million pieces. Our placement agency, Lifeline, says that we should be okay since our homestudy was already fully done. We will have to have a different agency to do our post-adoptions visits, but no time or money is lost. I'm sure the case is different for some families so we are thankful. 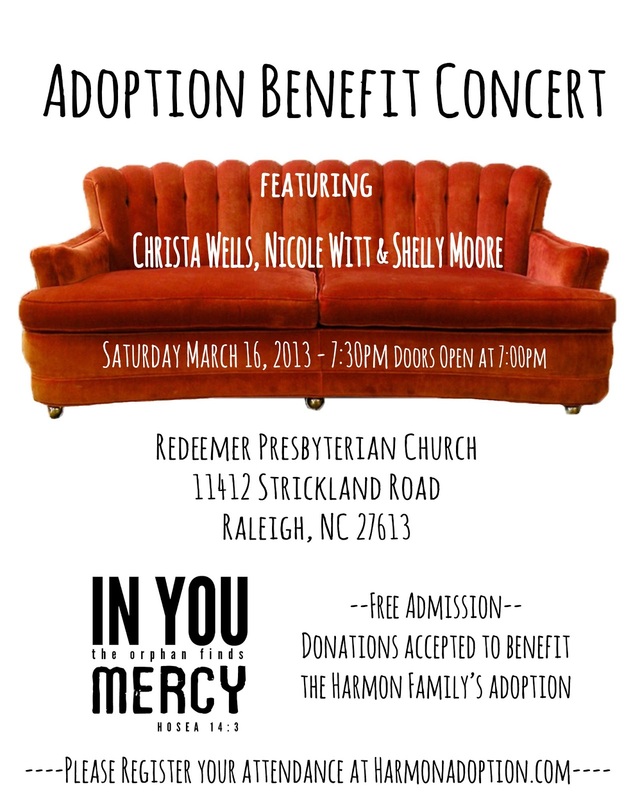 We hope you are planning to come to the concert on March 16th, friends. As we work though all the details of that night, we get more and more excited! These artists are going to bring you some amazing music. If you are coming, would you register at www.harmonadoption.eventbrite.com? It will email you free tickets to print and then please go invite a friend to come with you. We are amazed at the community around us coming together to make this night happen. Sweet community. We can't do things like this on our own. In all honesty, we reached a point of feeling very overwhelmed with it all a couple weeks ago and realized that, in our pride, we were trying to make this concert happen all on our own. We hadn't stopped to genuinely pray and ask God to work. And we asked God to work. And since then, we've seen amazing people come along side us to help with details and we've had more peace. We can't do this concert on our own... and the truth is we can't do this adoption on our own. We need the body of Christ, people who care about us and care about orphans and love God, to walk this road with us. So it is with much humility and gratitude that we invite you to come to the concert. And, pray, pray with us that God would be at work, stirring hearts, for His glory.